To acclimate users to the iPhone X, Apple is offering a phone conversation with an Apple Specialist, while watching a video on a computer to "help you go further" with the new device. 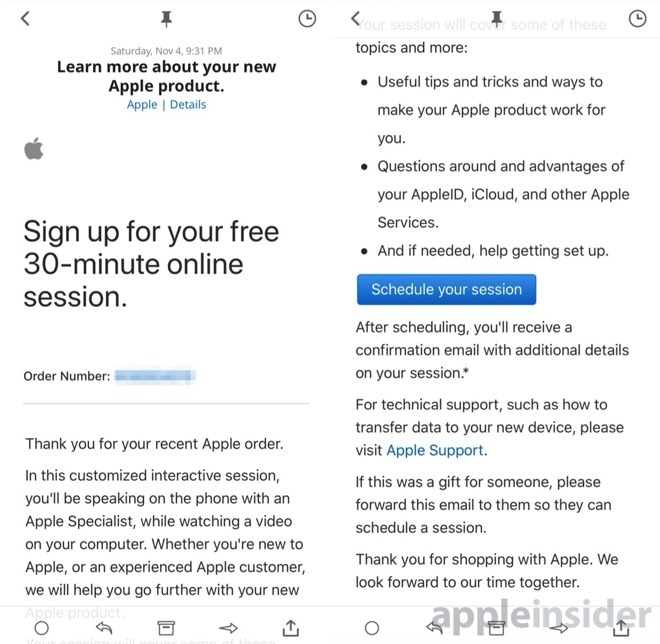 In the email to iPhone X purchasers, Apple calls the session a "customized interactive session." In the session, Apple provides tricks and tips to use the device, discussions about AppleID and iCloud, and help setting up the device if needed. The emails are labeled with an order number —but Apple suggests that purchasers can forward the email to the recipient if needed. Apple debuted an iPhone OLED screen, the Face ID system, and the True Depth camera with the iPhone X —which is now in customer's hands. To accommodate the new technologies, and lack of home button, Apple altered some user interface paradigms on the new model. The technologies included in the $999 iPhone are expected to migrate to Apple's entire fall 2018 line of iPhones.